After a few weeks of for a vacation, it’s time to get back to green algal photobionts. In addition to Trebouxia and Asterochloris, there are several other genera of Trebouxiophycean algae that act as photobionts for various groups of lichens. The most significant of these is probably Coccomyxa, which is the photobiont of many mushroom-forming basidiolichens and is also the green algal component of tripartite lichens in the Peltigerales. There hasn’t been much work on Coccomyxa, but there were two papers in 2003 that each sequenced ITS from 20-25 specimens. One study found that photobionts of basidiolichens, photobionts of Peltigeralian lichens and free-living strains each formed a distinct lineage (Zoller et al. 2003), while the other found that photobionts of two species each of Nephroma and Peltigera were nearly identical (variable at a single position), which a single Peltigera britannica photobiont was found to be significantly different (Lohtander et al. 2003). Coccomyxa and Pseudococcomyxa have also been reported as symbionts of protists including Paramecium and Stentor. 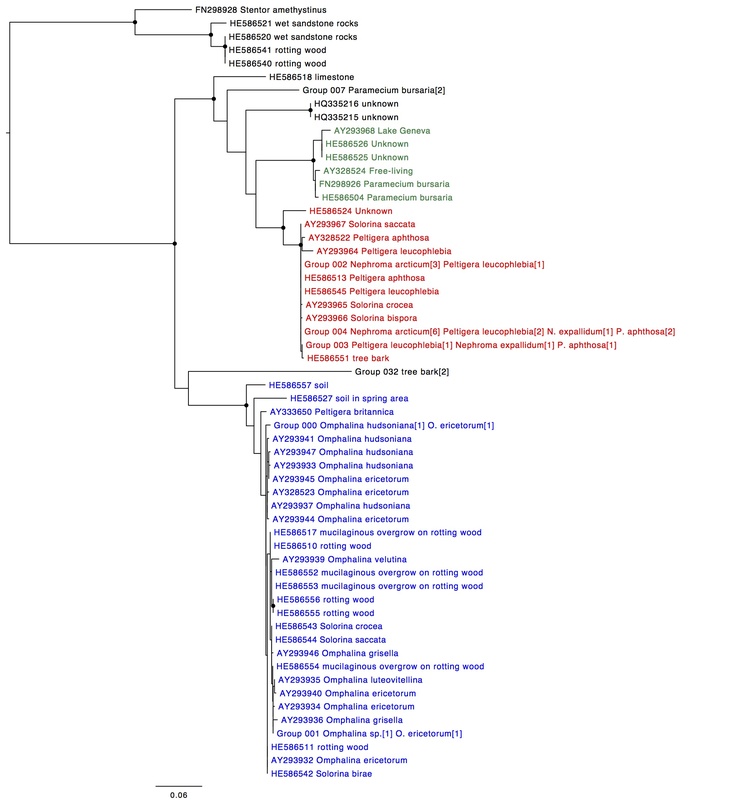 The clade coloured blue in the figure corresponds to the basidiolichen clade mentioned above. It also includes the outlier sequence from P. britannica found by Lohtander et al. The clade in red corresponds to the Peltigeralean photobiont clade above and includes all other Peltigera and Nephroma sequences obtained by Lohtander et al. The clade in green corresponds to the free-living clade. This free-living clade also includes two symbionts of Paramecium bursaria while two other P. bursaria symbionts and one from Stentor amethystinus fall outside of these three main clades. There are also a large number of additional sequences from free-living strains, which are scattered throughout the tree. Many of these in the basidiolichen clade are described as “mucilaginous overgrowth on rotting wood”, which is similar to the growth habit and habitat of many basidiolichens, so these may actually represent lichenized strains, but the study that these sequences are from is unpublished so I don’t know the details. This basidiolichen clade also includes unpublished sequences from photobionts of three Solorina specimens, which are Peltigeralean lichens. Strains identified as Pseudococcomyxa, Paradoxia and Choricystis are nested within Coccomyxa, so it appears that all of these strains represent the same genus, with different species specialised on rotting wood (either in association with basidiolichen fungi or possibly free-living), Peltigeralean lichen fungi, and fresh water (often in association with Paramecium). However, this specificity is not absolute, at least for the two lichenized species. There are also one or more additional species that grow free-living and in association with with protists, but that do not appear to be able to lichenize, though additional sampling will be required to confirm this. This entry was posted in Green Algal Photobionts and tagged Coccomyxa, Green algae, omphalina, Paramecium, Peltigerales. Bookmark the permalink.